I responded to a tweet from where I was offered help with my marathon training and was delighted to be sent some products to try out: Actipatch and Litozin. 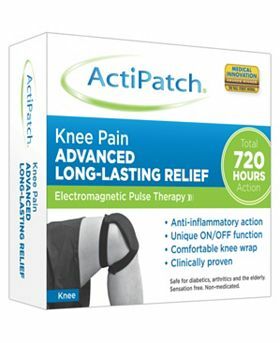 Actipatch is a product that is new to the UK. It’s described as a ‘comfortable knee wrap’ that is ‘clinically proven’ to provide ‘long-lasting relief’ using Electromagentic Pulse Therapy. It is the perfect alternative to pain medication for me to use before or after training to ensure my knees will allow me to perform to the best of my ability! I’m a little creaky at the moment, but I don’t think there’s anything wrong, so it’ll be packed in my bag ready for use as soon as I’ve finished on Sunday! I had real problems with my knees after my first marathon, so hopefully this will help to prevent similar problems this year. The second product that I’m trying is Litozin+, which is a ‘unique natural food supplement, made from specially processed rose hip berries. Long-standing Scandinavian research projects, together with 7 published scientific studies have established that rose hip powder may play an important role in maintaining healthy, flexible joints and joint mobility’. I’ve really noticed how stiff I’ve been recently, so I’m willing to give them a go. I need to take three a day with food, so I’ll be trying them with meals and will let you know how I get on. Do you rely on any health or fitness products to help you get through your training?